The humanitarian crisis following the Iraqi/Syrian catastrophe is enormous. Hundreds of thousands have been killed. Over 10 million people have been displaced in the region (more than the population of New York City). 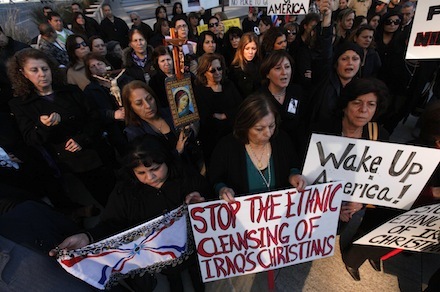 Women, religious minorities—including Christians—have been hit hard as Chris Hadley, S.J. points out in his moving guest post. Many of us agree that some sort of action is needed to address this Syrian/Iraqi crisis, especially when thousands of people are in immediate danger. But what should be done and by who? Yet again, the United States has sought to respond to an international crisis with unilateral military involvement. While the White House claims that it’s actions will be limited, political pundits and hawks in Congress have called for an increased military engagement in Iraq. Is the US bombing of Iraq the best solution? In these cases where there is an unjust aggression, I can only say this: it is licit to stop the unjust aggressor. I underline the verb: stop. I do not say bomb, make war, I say stop by some means. With what means can they be stopped? These have to be evaluated. To stop the unjust aggressor is licit. But we must also have memory. How many times under this excuse of stopping an unjust aggressor the powers [that intervened] have taken control of peoples, and have made a true war of conquest. One nation alone cannot judge how to stop an unjust aggressor. After the Second World War there was the idea of the United Nations. It is there that this should be discussed. Is there an unjust aggressor? It would seem there is. How do we stop him? Only that, nothing more…. The pope’s comments highlight several important aspects of the Catholic moral and social tradition on how we ought to respond to humanitarian emergencies. We have obligations to help people who are suffering regardless of their nationality or religion. The two pillars of Catholic social teaching (human dignity and solidarity) call us to action. Each and every human person is created in the image and likeness of God and has dignity. Our social bonds are so strong that if one suffers, we all suffer. If a nation-state is unwilling or unable to address the suffering of its citizens, then humanitarian intervention is not only licit but a moral obligation. State sovereignty, in other words, has never been an absolute moral principle in the Catholic tradition. Military action can be a legitimate response to protect human life, but only under specific circumstances and conditions. Chief among these conditions is legitimate authority (along with right cause, last resort, and just intention). The Responsibility to Protect framework, which Pope Benedict XVI endorsed during his address to the UN General Assembly in 2008, critically examines this point of legitimate authority for humanitarian intervention and argues that it is the United Nations and primarily the Security Council, that has the proper authority to address this issue. The comments by Francis, as Brandon Ambrosino points out over at Vox, are not out of “left field,” but are rooted in the Catholic just war tradition — which also stands behind the Responsibility to Protect Framework. Of course according to this tradition, any intervention, like war must be the last resort. The best thing we can and should do is to live up to our responsibilities to prevent such a conflict to arise in the first place. And when our previous actions have caused unintended consequences to live up to our moral obligations to the victims. Unilateral military action can cause more problems than it solves. It can be misused and abused. Consider, for example, the 2003 US war in Iraq which Saint John Paul II and the US Catholic bishops strongly opposed or the military involvement of the US in Latin America over the past fifty years. Now, the reality of course is that the UN system is not always able to effectively respond to humanitarian crises as they surface. The church and supporters of the Responsibility to Protect framework acknowledge this. But why is this the case? Why is the UN slow to respond? While the UN system is involved in heroic work around the world (such as the response to the Ebola epidemic), it has not been allowed to live up to its full potential largely because of US foreign policy. In Caritas in veritate, Pope Benedict called for a strengthening of the UN system with “real teeth.” This has been followed up with a Vatican note on global financial reform (see my previous analysis here) and by the Holy See’s diplomatic presence at the UN. Both Democrats and Republicans in the United States are reluctant to support a real global culture of multi literalism. The kid with the most toys in the sandbox does not like to share. This has caused resentment, prevented serious reform efforts of the UN system (especially proposals to reform the Security Council) and has arguably made the world more unsafe. 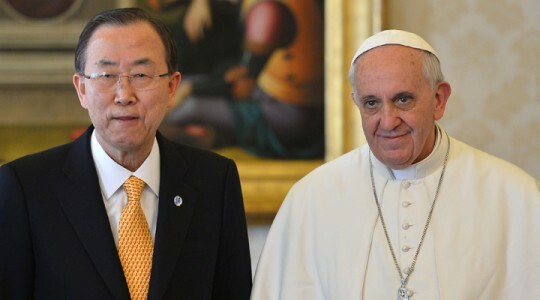 On his interview on the plane, Pope Francis also indicated for the first time that he plans on visiting the United Nations in New York on his visit next year to the United States. Like his three predecessors who visited the UN, we are sure to see more calls for a stronger system of global governance and a strengthening of the UN. Catholics in the Untied States have a specific moral obligation to support this effort. We need to put an end to cowboy diplomacy and work for a strengthening and real reform of the UN system. Let us not forget the people in Iraq and Syria. Action is needed by the global community. Today (August 19th) is World Humanitarian Day. 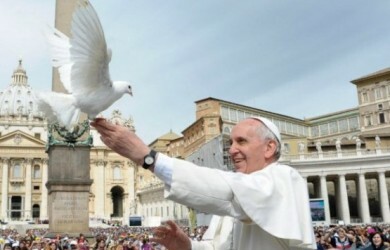 May the Holy Spirit unite and empower us to act together to aid all those suffering from injustice and war.